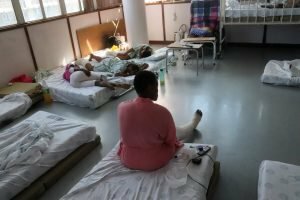 Orthopaedic surgery backlogs have become old news at Bloemfontein’s Pelonomi Hospital, but it’s still fresh hell for the patients admitted every day and forced to sleep on chairs, on floors and on stretchers pushed up against corridor walls waiting for beds, often for weeks. Even when orthopaedic patients at the hospital eventually get a “bed” it may be a mattress on the floor and sometimes men, women and children are forced to sleep in the same room. Patients are also being told that they could wait weeks to get to an operating theatre slot if their surgery isn’t considered a priority. This means patients with fractures considered less serious are simply left to wait. Delays in surgery puts patients at risk of complications in the future. Improperly treated bone fractures can lead to long-term or permanent nerve damage; deformity and disability; damage, rupturing or stress on the muscles and ligaments; blood clots and sores; infection in the bone and marrow or avascular necrosis – there the bone loses its blood supply and dies. If a neck fracture is left untreated it could result in paralysis or death. On top of this, patients are also told that if they choose to go home to wait for a surgery date they’ll lose their spot in the queue. Spotlight already reported in December 2017 on the shocking state of affairs in Pelonomi’s orthopaedic ward. It was a story of long waiting lists and undignified hospital waiting areas. At the time Free State Department of Health spokesperson Mondli Mvambi said “We are constantly making plans to intervene and cutting the backlog of services. We are appointing professionals especially to the periphery and the sustenance of orthopaedic services to Botshabelo.” Referring patients to Botshabelo has been a common refrain from the Department since Spotlight started covering this story. When Spotlight returned to Pelonomi earlier this month it appeared as if nothing had changed in the 16 months since we last wrote about the hospital – in fact the waiting times seemed longer, the wards more chaotic and the patients more defeated. Patients are told to limit the time they spend out of their wards, so nurses don’t have to repeat messages to them. For the patients it’s a torment of boredom, anxiety, frustration and discomfort being confined to a bed (if they lucky) waiting for surgery. The ward is noisy and stuffy with visitors coming and going at all hours and staff smoking inside offices behind closed doors. Patients speak of long queues for bathroom time, very little privacy and no communication or clarity on when they will get their operations. 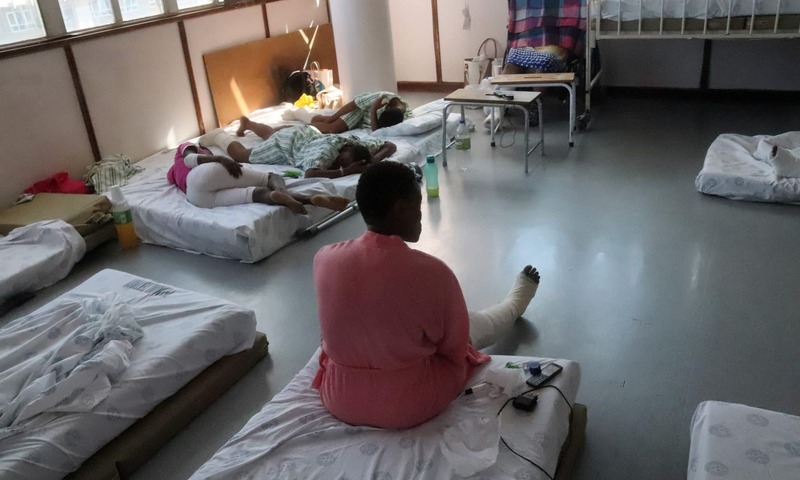 On a Tuesday morning earlier in March Mpumelelo Mattroos is one of the patients sitting on the zig-zag of plastic chairs in the waiting area of the orthopaedic ward. Mattroos arrived at the hospital two days earlier on the Sunday after being in a car accident that left him with a broken arm, cuts and bruises to his left eye and severe whiplash. He’s arm is bandaged and in a sling but he’s been told there’s no bed, and he must wait. His personal items he’s had to store in an emptied out plastic dustbin pushed into a corner. His coat is folded over the dustbin and he takes sips from a two litre bottle of cooldrink on the floor. Mattroos switches from sitting on the chairs to lying on the bare floor. He grimaces every time he moves. Another patient who is also sleeping on the chairs, translates for him as he tells Spotlight how frustrated, angry and in pain he is. “I thought at least I could have the operation today and leave by Friday because I must report at work,” says Mattroos, who works on a mine in Rustenburg. His employer doesn’t know his situation and he’s anxious he’s going to lose his job. As he talks he daubs at his weeping injured eye with his own handkerchief, he’s still in his own clothes, not hospital pyjamas. Later when the food trolley arrives he’s dished up a plate of food that he must balance on his lap and negotiate with his uninjured arm. Mattroos does get a bed later that night and his surgery is considered enough of an emergency that he’s operated on two days later. But he misses his deadline to get back to work, his future uncertain. Still waiting however, are the likes of Bereng Ishmael Ramosebi. He’s furious because it’s the second time in less than two years that he’s been in Pelonomi Hospital for a broken bone and each time he’s been left waiting. “It’s the same story. This is very painful that nothing has changed,” he says. Back in 2017 Ramosebi, who works as a security guard, broke his hand. It took nearly three months, he says, to get his surgery. In a ground floor ward this time around he’s been given a bed after two nights but he’s not been given a surgery date. In his ward one man with a broken leg has been waiting for more than six weeks unable to return to work. A student has missed two weeks of class waiting for surgery. 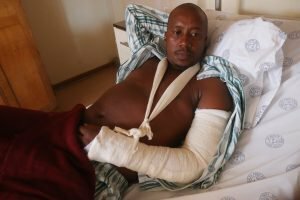 Ramosebi was injured running from robbers who attacked him for his cellphone and wallet. He hasn’t been able to communicate with family and friends or his employer since he came to the hospital. Five days into his stay he says he’s seen a doctor only once. Also among the orthopaedic patients is Treatment Action Campaign (TAC) Free State provincial manager Enoch Moware. 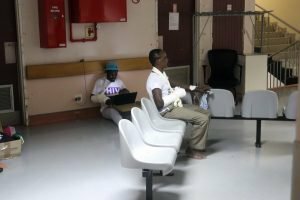 The activist broke his arm and was waiting at Pelonomi for a surgery date. He speaks about his experience, nearly three weeks into the wait. “I feel very bad. We are told stories like this all the time, but now I’m experiencing it for myself,” he says. Moware has used his hospital stay to push for action and insists on answers from hospital management. Eventually, he was told “contingency” plans would be put in place and efforts to close backlogs would commence. On Moware’s doctor’s note it says: “Due to the nature of theatre procedures it is difficult to predetermine the duration of his/her hospital stay”. Earlier this week, after nearly three weeks when he first arrived at Pelonomi, Moware was woken up at 2.30am, loaded in a van and transported to Botshabelo where the surgery was supposed to take place. At Botshabelo they were left till dawn in a waiting area with no clarity on what was about to happen to them. In October 2016 Spotlight reported on unlawful stem cell research being conducted at the hospital with the support and approval of the then Free State MEC for Health Dr Benny Malakoane. Experimental stem cell therapy was being used to treat musco-skeletetal diseases in orthopaedic knee patients. As soon as Spotlight alerted authorities the Medicines Control Council (MCC – now SAHPRA) suspended the unlawful stem cell experimentation at the hospital. At the same time the Free State Department of Health cancelled its contract worth a potential R90-million with the company ReGenesis Biotechnologies, the company that was conducting the unlawful trial. What angered doctors is that the department was prepared to spend this money on an unlawful trial, but did not have money to conduct straightforward orthopaedic surgery. Following coordinated exposes by Spotlight and the television programme Carte Blanche, Malakoane was moved out of the health portfolio in the following week. Even though the Free State department of Health was involved in an unlawful trial and was set to spend tens of millions of Rands on unproven and potentially dangerous stem cell therapies, neither Malakoane or the ReGenesis doctor Wian Stander have been investigated by authorities or the Health Professions Council. Spotlight also reported in October 2018 on the on-going problem of inferior hospital equipment supplied by a company called Mediquip Hub SA to Free State hospitals, including equipment needed for orthopaedic surgery at Pelonomi. It is a tale of, among others, nepotism, contracts for political allies, unusable x-ray machines, wonky theatre beds and theatre lights that are too low. Mvambi acknowledges that Pelonomi has been under pressure for years. He ascribes it to the “flood of patients” from surrounding areas and also because of high road accident numbers as major national roads cut through Bloemfontein. He claims they had managed to clear a backlog of about 200 orthopaedic surgery cases in 2018 and early 2019. However, he says storm damage in February to Botshabelo Hospital (about an hour from Pelonomi), that had worked with Pelonomi to alleviate the backlog, resulted in Botshabelo’s operating theatres being temporarily put out of commission. He said operations at Botshabelo would resume by 20 March. He also said several other measures had been put in place to ease congestion at Pelonomi. Some of these, he says, include clearing unused Intensive Care Unit areas to make bed space, instituting 24-hour surgery lists and operating at Albert Nzula Hospital. This facility is over an hour away from Bloemfontein, making it difficult for family and friends to support patients there. The department didn’t answer Spotlight’s questions regarding what is considered a reasonable waiting time at Pelonomi , the costs involved with accommodating patients for extended waiting periods, and continued allegations of irregularities in procurement of services and equipment including the use of locum agencies.